As U.S. imperialism loses its capacity to compete outside the military sphere, its foreign policy options shrink, accordingly. “Since the U.S. is superior to the rest of the world ONLY in military terms, Washington finds its ultimate advantage in turning the whole world into a battlefield.” Permanent War follows the same logic as a death cult. In fact, one created the other – literally. President Obama is a master of military supply and demand. 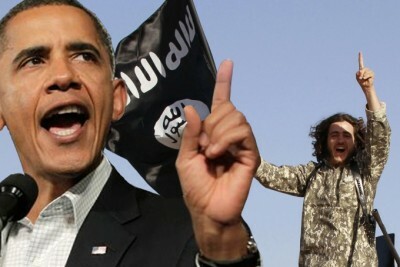 His operatives and allies supply jihadists with enough weapons, financing and, in the case of Libya, a Euro-American air force, to plunge vast tracts of Africa and Asia into bloody chaos, thus creating a demand for intervention by the planet’s only “indispensable” nation: the United States. It’s a diabolical formula for fomenting hell on earth, driven by a simple logic: Since the U.S. is superior to the rest of the world ONLY in military terms, Washington finds its ultimate advantage in turning the whole world into a battlefield. U.S. imperialism in terminal decay sees no salvation except through global war. Of necessity, Obama is a flame-thrower, a fire-spitter, a pyromaniac on a mission to incinerate humanity’s capacity to resist – a vision shared by the jihadist death cults America has incubated for the past four decades. ISIS, the Islamic State, begat by Al Qaida, which was begat by Saudi Arabia, Pakistan and the U.S. in Afghanistan, now declares sovereignty over portions of Libya, having occupied much of Syria and Iraq and planted the black flag in southern Yemen and the suburbs of Paris, where its token presence is enough to drive millions of Europeans into a decrepit Crusader palsy. A subcontinent of thieves who have plundered the planet for half a millennia vow to send the dark Others back to “their own countries” – as if Europe had not stolen these African and Asian homelands long ago. In the end, however, what Europe will send is more weapons to the jihadists, mimicking Uncle Sam. This week, as happens every year, France, Britain, Italy and other piratical European states join the U.S. Africa Command’s military Flintlock exercise, designed to deepen African militaries’ dependence on western weaponry, training and finance. Chad, a client state of both Washington and Paris, is the nominal host of the exercise – as if any of the African participants could actually say No to an imperial proposal. The Flintlock maneuvers have converged with a regional military offensive against Boko Haram, the northern Nigerian jihadists that have gained so much ground since the U.S. and NATO turned Libya over to the tender mercies of Arab jihadists, in 2011. Libyan weapons flooded south across the Sahara desert, bringing instability to the vast Sahel region – which is like honey to the Pentagon bee. The U.S. military has announced that it will “share communications equipment and intelligence” with the five nations preparing to battle Boko Haram around oil-rich Lake Chad – imperial double-speak for putting the Americans in charge of the command-and-control mechanisms of the armies of Chad, Nigeria, Niger, Cameroon and Benin. Boko Haram has proven quite useful to the consolidation of U.S. military dominance in West Africa. Meanwhile, the jihadist rampage has come full circle in Libya, where both ISIS and Al Qaida have multiple strongholds. Jihadist “ultras” are most deeply entrenched in Derna, a port city east of Benghazi that accounted for the most jihadists killed or captured in Iraq during the American occupation. When U.S. and NATO finally destroyed Muammar Gaddafi’s forces after seven months of bombing, hundreds of jihadists were sent to Syria, hoping to repeat the process against President Bashar al-Assad. Many have since returned to Libya, bringing the black flag of the Islamic State with them. Egyptian dictator Abdel Fattah el-Sisi, a supporter of one of three rump “governments” in Libya, bombed ISIS targets in Derna after the decapitation of 21 Egyptian Coptic Christian migrant workers. The atrocity, combined with a declaration of allegiance to ISIS by some Islamic rebels on Egypt’s Sinai peninsula, prompted el-Sisi to call for the U.S.-led coalition against ISIS to put Libya on its bombing list– an invitation from the world’s most populous Arab nation for the U.S. to extend the scope of its military operations to Egypt’s western border. Jihad is truly a blessing for U.S. imperial objectives – but there is nothing coincidental about it. The U.S. installed jihadists in power in Libya, leading directly to the destabilization of vast lands to the South, which in turn facilitated the U.S. Africa Command’s mission to militarily dominate the continent. The U.S.-led jihadist proxy war against secular Syria was the incubator for ISIS, providing the U.S. with a new portal into Iraq, an excuse to operate openly in Syria, and now a possible chance to re-enter Libya cloaked as a savior from the jihadist hordes that the U.S. armed, financed and empowered only four years ago. ISIS has been such a boon to U.S. war-fomenting strategy, Obama has been emboldened to demand that Congress give him three years of virtually unlimited, renewable powers to reboot the War on Terror. Like George Bush before him, Obama refuses to put geographic limits on the scope of his crusade against ISIS and its “associates.” The world is his live-fire chessboard, he can call the pieces by whatever name he wants, and make up the rules along the way. Every move is calculated to lead to greater militarization of relations among nations and peoples, because the military is America’s strongest suit – in fact, its only suit. The truth is, the rulers of the United States are as much a death cult as the Islamic State, although U.S. imperialism is infinitely more dangerous. Let us do our best to send them both to their respective Paradises.